"I also subscribe to the Motley Fool Income Investor and the Morningstar Dividend Investor...but the CDx3 Notification Service is my favorite..." - Tom O. As always, welcome to all of the new CDx3 Newsletter subscribers who signed up during April. This is your first issue of the CDx3 Newsletter, a free monthly newsletter devoted to the interests of CDx3 Preferred Stock investors. To be sure that you continue to receive the CDx3 Newsletter each month, please remember to add the following email address to your email address book safe sender list: CDx3NotificationService@us.emaildirect.com. April was a wild month for CDx3 Investors. Just as the month was wrapping up, two new CDx3 Preferred Stocks were issued that pay the highest dividends rates that we have seen since December 2002. The Last Month's CDx3 Investor Results article below provides a chart that shows how these two late-April offerings stack up against the other CDx3 Preferred Stocks that have been offered so far this year. This month's Special Announcement article summarizes my meeting with the SIR group in Santa Rosa, California where I was pleased to meet several readers of Preferred Stock Investing and subscribers to the CDx3 Notification Service. The Special Announcement article provides a link that you can use to download educational meeting materials for your investment group - no charge. Tired of reviewing the same tired reports at your group meeting? Why not learn something about preferred stock investing? Ever read a stock prospectus? You don't have to read very far before doing almost anything else starts to sound pretty good. They're a tough read, no doubt about it. In this month's CDx3 Company Spotlight article I would like you to meet Southwest Gas Company. I will use one of their CDx3 Preferred Stocks to show you, click by click, how to quickly and easily find some of the key prospectus language that CDx3 Investors tend to be most interested in. This month's CDx3 Question Of The Month article continues a theme from the last few issues of the CDx3 Newsletter regarding the dividends paid to you by CDx3 Preferred Stocks. This month, I answer a question from Peggy G. that shows you how you can build a CDx3 Portfolio without having to continually invest new money. Crisis? What crisis? Just when it seemed like we had seen the high water mark for the annual dividend rate offered by new CDx3 Preferred Stocks, two new issues were introduced in late April that pay a stunning 8.875%. The average dividend rate being paid by newly issued CDx3 Preferred Stocks has now reached a record high of 8.250%. 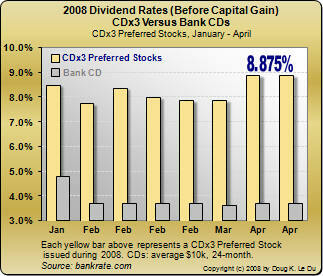 There has only been one other CDx3 Preferred Stock, issued on December 6, 2002, that pays dividend income this high. While wondering if we would ever see this kind of rate again, two new issues appeared before CDx3 Investors within two days of each other, the first on April 28 then another on April 30, 2008. Thanks to banks: Cash-strapped banks have dominated the recent market for CDx3 Preferred Stocks, bidding up the dividend rates offered on new issues in order to attract investor cash. CDx3 Preferred Stocks were paying annual dividends around 6.75% when this buyer's market started last June; the average annual dividend rate being paid by new CDx3 Preferred Stocks reached 8.25% in April. This at a time when the average annual interest rate being paid by bank Certificates of Deposit (CDs) is 3.67% (24-months, $10k; source: bankrate.com). The above chart shows the annual dividend rates paid by the eight CDx3 Preferred Stocks that have been issued so far this year. You can see the two April issues that I'm talking about, each paying a stunning 8.875% annual dividend. Glass slipper test: Only about ten percent of ordinary preferred stocks qualify to be "CDx3 Preferred Stocks." These gems will filter through the ten CDx3 Selection Criteria at a rate of about 1-2 per month. When CDx3 Preferred Stocks are introduced, you can generally buy them for about $25 per share. CDx3 Investors sold the last CDx3 Preferred Stock with a 8.875% dividend rate for $27.53 about six months after purchase, earning an effective annual return of 28.95% (PSI, page 128). What are the trading symbols? Preferred Stock Investing teaches readers how to identify and purchase new CDx3 Preferred Stocks when they are introduced and Chapter 14 of the book provides the web sites and other resources that you need to be a successful CDx3 Investor completely on your own. If you would rather not take the time, subscribers to the CDx3 Notification Service receive a CDx3 Buyer's Notification email message whenever there is a buying opportunity - complete with trading symbols; we do the work for you. CDx3 Investors use CDx3 Preferred Stocks to earn both above-average dividend income and capital gain income when it comes time to sell; exactly how and when one does so varies depending upon market conditions (as explained in Preferred Stock Investing). This is the heart of the CDx3 Income Engine - use the highest quality preferred stocks to generate great fixed dividend income until a selling opportunity presents itself. If you are interested in learning how to screen, buy and sell the highest quality preferred stocks, please consider purchasing Preferred Stock Investing and/or subscribing to the CDx3 Notification Service. This is a great time to have the CDx3 Income Engine working for you. 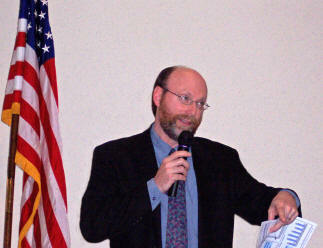 On March 21, 2008, the Friday following Saint Patrick's Day weekend, I had the pleasure of addressing the Sons In Retirement group in Santa Rosa, California. While it was hard to step away from the corned beef and cabbage, eventually it was time to share some thoughts about investing in preferred stocks. In a group this size, all levels of expertise will be represented so the specific topics and questions ranged from why preferred stocks have more potential than bonds to how Moody's ratings work, cash flow investing, risk management and the current "credit crisis." It was great to speak directly with several Preferred Stock Investing readers and subscribers to the CDx3 Notification Service who were in the audience that day. Another major point of interest was the Three Rules of Market Price Predictability from Chapter 5 of Preferred Stock Investing. These are the three primary forces within the market for CDx3 Preferred Stocks that tend to affect market prices in a fairly predictable manner. As you might guess, knowing something about the direction of market prices, and the reasons why they behave the way that they tend to, is of key interest to those considering an investment. Groups are always surprised to learn of the wide variety of preferred stocks that are available and, many times, express some frustration that their brokers rarely make them aware of the available alternatives. With the dividend rates being offered by new CDx3 Preferred Stocks now exceeding 8%, many fixed-income investors are finding renewed interest in the highest quality preferred stocks. Free Investment Group Materials: If you are a member of an investment group, there are free preferred stock investing meeting materials available for you to download from the PreferredStockInvesting.com web site. Why not learn something new at your next group meeting? The meeting materials are available in three formats: (1) color handout, (2) black and white handout and (3) color slide show presentation. All three can be downloaded and viewed on a Mac or Windows computer and are available to you for free by clicking here. Thanks again to the members of the SIR group in Santa Rosa, California for your hospitality. While cash-strapped banks have dominated recent offerings, CDx3 Preferred Stocks are issued by a wide variety of companies from a number of diverse industries. One such company is Southwest Gas Corporation, a $1.3 billion utility headquartered in Las Vegas, Nevada. Founded in 1931, Southwest Gas distributes natural gas to almost two million residential, commercial and industrial customers throughout Arizona, Nevada and California. Recently upgraded by Citigroup from Hold to Buy, Southwest Gas has managed to remain profitable during a turbulent time for its residential customer base. The Series B CDx3 Preferred Stock from Southwest Gas Corporation (SWX-B: QUOTE) was issued on August 21, 2003 and pays a 7.7% annual dividend. After SWX-B was issued, it would be another four years, almost to the day, before another CDx3 Preferred Stock that paid this high of a dividend would come along. SWX-B was the high water market for four full years until last year's credit crisis pushed banks to take over the top spot (now at 8.875%). What were they thinking? When Southwest Gas issued SWX-B in August 2003, the "going dividend rate" being offered by new CDx3 Preferred Stocks at the time was about 6.75%. Why would Southwest Gas issue SWX-B at 7.7%, almost a full percentage point higher than the going rate? This is where knowing how to quickly find and read the prospectus of a CDx3 Preferred Stock comes in very handy. Using the actual prospectus on file with the U.S. Securities and Exchange Commission, I am going to teach you how to navigate the maze of prospectus language that often befuddles individual investors. Easier than it looks: Finding and reading key provisions within a stock prospectus is not as bad as everyone seems to think; and right now, I'm going to prove it to you. Before we start, ask yourself this quick question: if you were paying 9.125% on your home mortgage and had a chance to refinance it to a new, lower rate of 7.7% (fixed) without any costs to you, would you do it? Keep that in mind for the next few paragraphs. every CDx3 Preferred Stock prospectus includes a section titled "Use of Proceeds" that describes what the issuing company intends on doing with your money. Pull up the text search function on your browser (Internet Explorer and Firefox: look under the Edit menu and click Find On This Page) and search for the phrase Use Of Proceeds. The first two occurrences will be in the Table of Contents; skip these by clicking on Next. The third occurrence is the one that we are looking for. you will see a paragraph that starts with the words "The Trust will use..." This paragraph goes on to explain that Southwest Gas is going to use the proceeds from the sale of SWX-B to "call" (buy back from its owners) a previous preferred stock issue. "...We intend to use all the net proceeds from the sale of the junior subordinated debentures [that's code for preferred stock] to redeem the $60 million of 9-1/8% preferred securities of Southwest Gas Capital I..."
Southwest Gas was incented to offer SWX-B at a 7.7% dividend rate because they were going to use SWX-B to generate the cash that they would need to call an older preferred stock that was costing Southwest Gas 9-1/8% (9.125%). This maneuver is what Preferred Stock Investing refers to as "refinancing" (PSI, page 54) and that's exactly what it is - very much like refinancing a mortgage. Southwest Gas had an opportunity to refinance an old preferred stock that was costing them 9.125% to a new preferred stock that would only cost them 7.7%. In dollar terms, this refinancing allowed Southwest Gas to stop paying out $2.28 per share to owners of the old preferred stock in favor of paying out a mere $1.92 per share to the holders of the new SWX-B; a savings of $0.36 per share on 4,000,000 shares every year (pretty soon, we're talking about real money). Find key provisions fast: By using your web browser's text search function, you can quickly and easily navigate the prospectus of a CDx3 Preferred Stock (which can often run over 100 pages of legalese) for the key provisions that most individual investors are interested in. The trick, of course, is knowing the key words and phrases that these lengthy but important documents tend to use so that you can find the key provisions in seconds, rather than minutes or even hours. 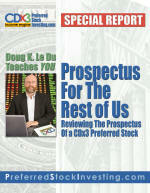 The CDx3 Special Report titled "Prospectus For The Rest of Us" (PDF format, $4.95) uses the prospectus of several real CDx3 Preferred Stocks, on file with the SEC, to teach you these key words and phrases and how to quickly and easily search for them (sample | purchase). Do the dividends generated by preferred stocks 'compound' like interest in a bank CD? - Peggy G.
A common investment goal is to reach a point where your investments generate enough income to become "self-funding" - generating enough cash to purchase the next investment without requiring any new money from you. This mechanism is referred to as "compounding" and is very easy to witness with savings accounts or bank CDs and works in much the same way with a CDx3 Preferred Stock portfolio. Example: Even though the average dividend rate being paid by today's new CDx3 Preferred Stocks is at 8.25%, let's use a more common 7% to see how this works. A CDx3 Preferred Stock that carries an annual dividend rate of 7% means that the issuing company is going to pay you 7% of $25.00 every year in dividend income for every share that you own. It does not matter what your original purchase price was, nor does it matter what the current market price of your CDx3 Preferred Stock is; dividends are paid based on $25.00 (called the 'par' value) per share. 7% of $25.00 is $1.75 per year in dividend income to you for every share. New CDx3 Preferred Stocks are issued at a market price of $25.00 per share. Let's assume for the moment that this is your purchase price; each share that you purchase costs you $25.00. To keep the math simple, let's also assume that you always buy a single share whenever you purchase a new CDx3 Preferred Stock. In order for your CDx3 Portfolio to generate the $25.00 needed for your next purchase, you would need several CDx3 Preferred Stocks pumping out $1.75 each in dividend income, right? 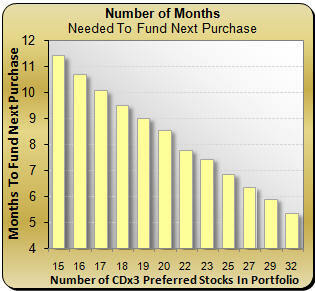 Specifically, you would need fifteen CDx3 Preferred Stocks in your CDx3 Portfolio. With fifteen CDx3 Preferred Stocks, each producing $1.75 per year in dividend income, your CDx3 Portfolio will generate $26.25 per year in dividend income - enough to purchase the next CDx3 Preferred Stock with no new money from you (and have $1.25 left over toward your next purchase). Since new CDx3 Preferred Stocks are issued at a rate of about 1-2 per month, and there will be times when you will decide to pass (i.e. it is unlikely that every new issue is going to be consistent with your personal financial resources, goals and risk tolerance), it usually takes about eighteen months for a CDx3 Investor to reach the point where their CDx3 Portfolio becomes "self-funding." It is for this reason that a subscription to the CDx3 Notification Service lasts for eighteen months. Now to the beauty of compounding: As I have just shown, the fifteen CDx3 Preferred Stocks in your CDx3 Portfolio generate the cash you need to buy number sixteen. Once you purchase number sixteen, your CDx3 Portfolio will generate another $25 even faster since you now have an additional CDx3 Preferred Stock pumping out dividend cash. As you can see by the chart below, your sixteen CDx3 Preferred Stocks generate enough dividend cash to purchase the next CDx3 Preferred Stock (number seventeen) in a little over ten months. While it takes just over eleven months for fifteen CDx3 Preferred Stocks to generate the first $25 in dividend income, once you have 32 CDx3 Preferred Stocks, your CDx3 Portfolio will generate $25 in dividend income every 5 months or so (the compounding effect accounts for the uneven increments in the horizontal axis on this chart). If you make regular purchases, say one per month on average, in less than three years your CDx3 Portfolio will be generating enough dividend income to make the next purchase completely on its own every few months. This process accelerates with each new purchase, your CDx3 Portfolio becomes the CDx3 Income Engine, generating cash at an ever increasing rate - compounding. Thanks to Peggy G. for the great question. 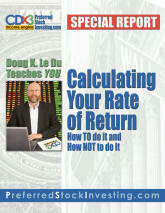 You will receive a complementary copy of the CDx3 Special Report Dividend Accounting. The Federal Reserve Board's aggressive involvement in the March JPMorgan acquisition of Bear Stearns, effectively guaranteeing that the federal government would not allow Bear Stearns to bust, precipitated several articles in the financial press saying that this action by the Fed had effectively ended the "credit crisis" that our financial institutions have been faced with since last summer. By their action, the Fed was making it very clear just how committed they really were to preserving our financial markets. All were anxious to see what would happen throughout April - would investors act on such commitment and optimism or would they continue to hoard cash like a chipmunk ahead of winter? During April, investors did indeed start returning massive amounts of cash to the market. The price of treasuries and gold, two favorite hoarding places, dropped dramatically throughout April (gold fell from well over $1,000 per ounce to the high $800's); the amount of daily loans sought by banks fell to $24.8 billion from $32.6 during the week of April 16 (source: Federal Reserve); and Citigroup, the nation's largest bank, posted higher than expect first quarter revenue and cut its quarterly loss in half from the previous quarter. The March declarations that the "Worst Is Over" appear now to have been more correct than simply optimistic. In late April, the Fed reduced interest rates again by 1/4 point, which was widely expected. But their comments that accompanied this reduction seemed to confirm that banks were, in fact, seeing light at the end of this tunnel of misery. The Fed signaled that after this 1/4 reduction, there was likely to be a pause in such policy actions to allow time to evaluate the markets. The Fed has no meeting scheduled for May, so it is likely to be June before there is any more action by the Fed, if then. In next month's CDx3 Newsletter, I will report back to you on the effect that the Fed's pause has on the market for CDx3 Preferred Stocks going into the summer.